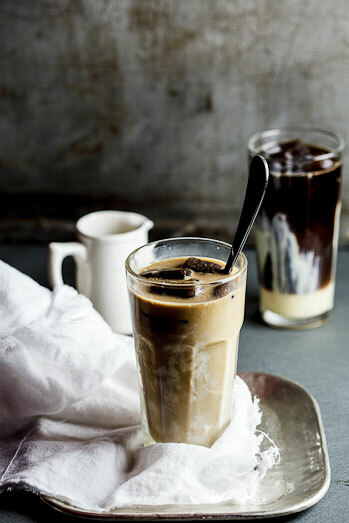 This iced coffee sweetened with condensed milk is completely delicious and the coffee ice cubes adds even more punch without diluting your drink. I am an iced coffee addict. I drink it whenever I can and am often disappointed. 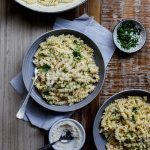 That’s why I try to make it myself whenever I can and have experimented with different flavours and forms of dairy and have finally come up with my ultimate version. 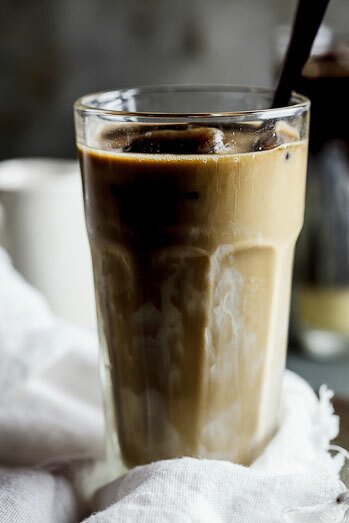 I like to make mine in a similar way to the classic Vietnamese coffee which is strong black coffee sweetened with condensed milk. What I don’t like however is when the ice melts and waters down the coffee so I like to freeze coffee in ice cube trays and use that to cool down my coffee. 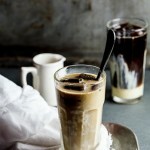 Just writing about it has me salivating and believe me, this iced coffee is incredibly addictive! 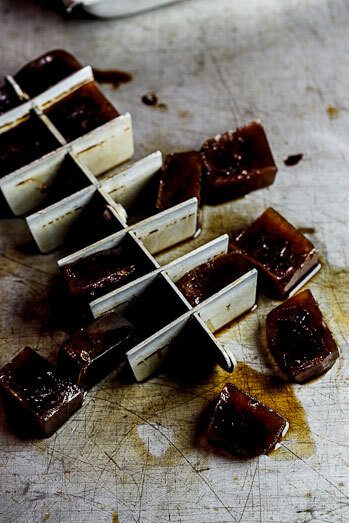 Pour cool strong coffee into ice cube trays and freeze until solid. 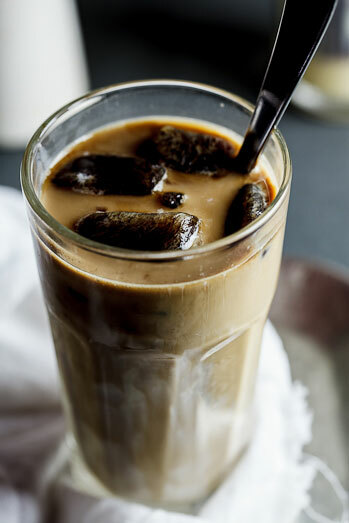 Fill a glass with coffee ice cubes and top with cold coffee. Mix together the condensed milk and milk and pour into the coffee. Amazing photos, Really I liked it!!! Perfect for that afternoon slump Alida! LOVE the coffee ice cubes! Great idea. What brand coffee do you like? I have tried several and can’t seem to get a good tasting coffee made from my regular coffee maker. Not sure what the deal is. Any suggestions for me? I’m excited to try this! If I made the coffee before work how long do you think it’d take to cool down? I’m usually a wake up and out the door kinda gal. I don’t have a specific brand that I like, to be honest. If you add the ice cubes it should take no longer than a few minutes to cool down. Vietnemese coffee is my favorite for iced coffee because it’s often roasted with cocoa & butter oil and robusta is used for strength. 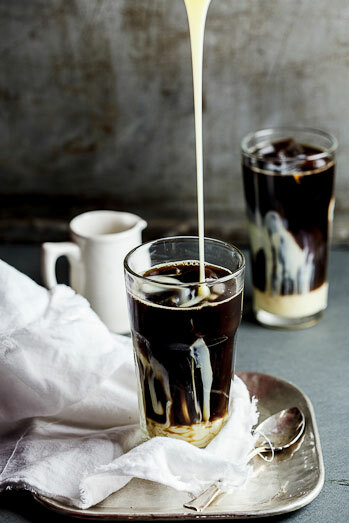 Most Arabica is too weak when used with sweetened condensed milk. Most people brew Vietnemese coffee with too much water so when the ice melts the coffee is too weak. The authentic way is to brew it at a ratio of 3 parts water to 1 part coffee. Example: 25 grams coffee with 75 grams water, that way it’s so strong that some melting ice doesn’t effect taste dramatically. People in North Vietnam use less sweetened condensed milk so the coffee looks brown. In the South they use more so it’s more like a milky beige color. My favorite coffee is Trung Nguyen Creative #4. I could use one of these right about now! Yum!! Sandi, I just keep it in the fridge and it does thicken up slightly but nothing too bad. Perhaps add it to the coffee before adding the ice cubes to prevent it from settling at the bottom? How do you store your SCM? I store mine in the fridge but have to heat it up before putting it in iced coffee ( or else it won’t mix in well) . Darlene, I just use whatever I have in the house. Often Jacobs, sometimes I’ll use a Nespresso pod. Really just whatever I have, really. What brand of coffee do you use? It’s such a pleasure! Glad you liked it. coffee ice cubes. = ftw!!! 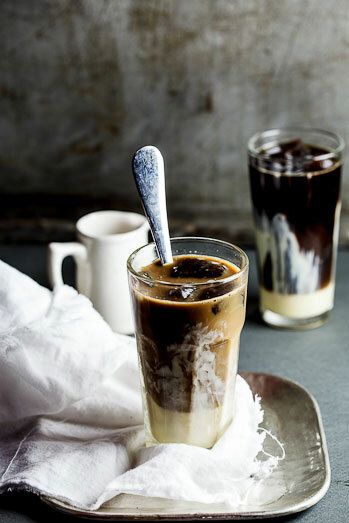 I LOVE iced coffee, but a STRONG version. And only recently started making my own iced “coffee” cubes to add to in my drink. Great idea!!! Without all the watering down accompanied by boring iced cubes. On top of that I just discovered sweetened condensed milk is WONDERFUL!!! It’s silky creamy sweet consistency mix very well into a “cold” drink. I have no idea why I had not heard or thought of this before? These two things brought my boring iced coffee to the next realm. 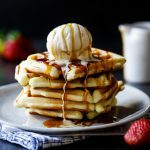 I was reading your “food styling” post, and saw the pic from this iced coffee post. After I made myself a nice cold one, I then visited this post of yours. The pics are SO STUNNING. I love your recipe and everything. So glad you liked it. It’s a goodie! Literally got up, walked into my kitchen and made this! Delicious!! Thank you!! oh my. this is amazing thank you so much. How “strong” do you make the coffee? Can you estimate amount of coffee per cup? Anita, you should make it as strong as you would drink it. So make each cup as you would drink it. Perfect! I also now love sweetened condensed milk in my coffee whether it is hot or cold. When you say “black coffee”, do you mean espresso or do you mean regular american coffee with nothing added (cream or sugar)? Regular American coffee with nothing added will be best. Your photos are amazing and the drink sounds delicious! 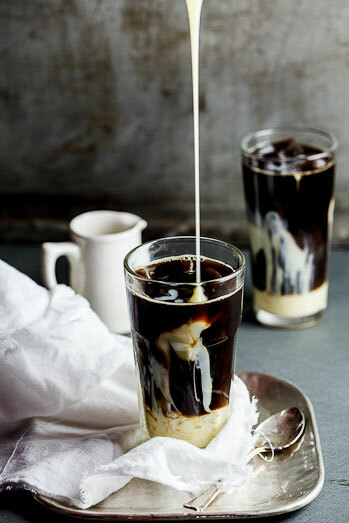 I’ve never tried coffee and condensed milk together, but it sounds so good! I can’t wait to try this! Rosie, you will love it! Ek is nou so lus vir so ‘n koffie! Love die idee om koffie-ys te maak. Jou fotos en styling is pragtig!